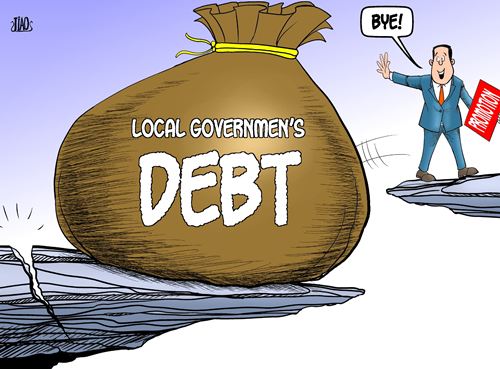 Publicity has recently been given to China's local government debt. At a certain level raising this issue is justified. It is what might accurately be termed a medium size question: of the type which periodically arises, which needs to be tackled, but where clearly the resources exist to adequately deal with it. Unfortunately the issue has become blown out of all proportion. It is rather like similarly overblown hype that there is a risk the US government may default – the US is not going to default and China's municipal debt does not threaten instability for China's financial system. It is therefore worth looking at the fundamentals of the issue. The immediate reason for the discussion was a report issued at the end of June by China's National Audit Office which stated that the debt of China's local government stood at 10.7 trillion RMB ($1.7 trillion). This was noted in international media such as the Financial Times, which also cited as its first comment Macquarie Securities' head of China economics stating: "I don't think government is super-scared this problem is unmanageably large and the amount of loans outstanding is going to cause big problems." However early in July the debt rating agency Moody's published a report claiming that the real debt was 14 trillion RMB ($2.2 trillion) – i.e. the National Audit Office had underestimated by over $500 billion. The Wall Street Journal cited a Moody's spokeswoman saying that this meant that non-performing loans of China's banks could reach 8-12 percent of the total. According to the Wall Street Journal: "Ms Zhang dismissed the argument that China's largest banks have less exposure to local government loans than smaller ones and are more capable to withstand the risks. "They can't run away, they are at the forefront of lending," she said. This report was strange for a number of reasons. First, it merely concluded that in light of these figures Moody's believed the credit outlook for China's banks could potentially turn negative – an inappropriately mild response to any real threat that bad bank loans could reach 12 percent of the total. Second, no timescale was given for this allegedly alarming eight to tenfold deterioration of the financial position of China's banks from a currently reported minor 1.14 percent level for bad loans (which had fallen by 0.44 percent since the end of 2009). Despite these peculiar features Moody's report generated sensational news coverage. China's Central Bank published an official statement on July 18 pointing to the error in Moody's calculations. According to the Central Bank, Moody's had simply divided the amount of total bad loans in China by the proportion of bank loans which were made to local government. This is clearly not a legitimate calculation – the two ratios need not be the same at all. At the time of writing there have been no reports Moody's have replied to what would be a fundamental criticism.